Homes across the world and through the ages are built on the architectural foundations of longevity, comfort and safety. Across the globe the traditional brick and mortar or wooden homes are characterised by an un-skilled workforce, substantial natural resources requirements, waste and cost overruns. With changes to the global economy, the shortage of resources and the need for rapid deployment of housing solutions – populations are having to think of homes in a new way. On the Southern Tip of Africa, WolfPack Rentals is leading a new trend in housing solutions – readily available and repurposed shipping containers that reduce the material requirements for a home while recycling the trove of shipping containers that lie dormant on our shores. 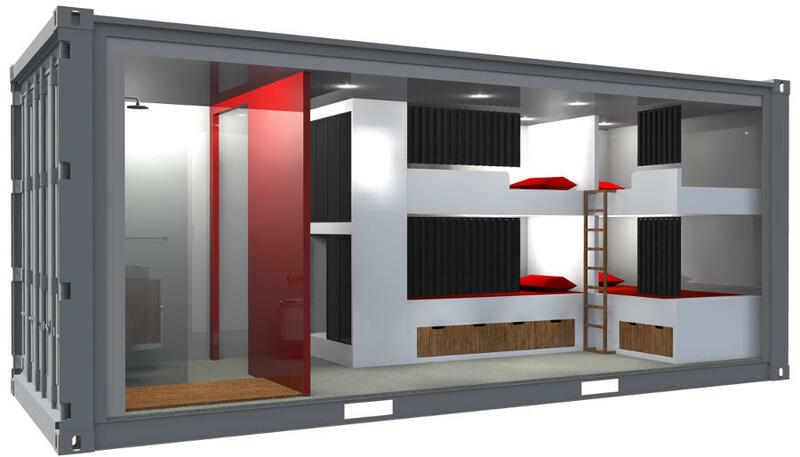 Built to withstand the harsh conditions of the high seas, the inherit architecture of shipping containers have always focused on durability and stability – functions that provide a direct benefit to the repurposing of the containers for mobile, flexible and modular housing solutions. We are recycling, refurbishing and repurposing these containers, they are modular and mobile in all the same ways as the shipping containers they start from. These repurposed shipping containers are slowly taking hold. Private homes are one consideration, but so are the possibilities of semi-permanent, temporary or seasonal workforces being housed efficiently and comfortably. Similarly, Hotels can pop-up to change the scenery or meet current local demand. Excellent as a raw material, working with containers significantly reduces waste production, reducing conventional waste from 30% to around 1% waste. This is about three skips of rubble against a garbage bag. The reefer container, used in our projects, is a highly resistant construction, produced with COR-TEN steel, aluminium and a very efficient thermal insulator. It is designed for shipping on the rough seas and to withstand salt water and corrosion ever day. Its easy maintenance ensures durability for generations when ashore. Costs are relatively similar to those of a conventional small dwelling, although repurposing a recycled container over using a brand new container automatically brings with it immediate costs reductions. Advantages are numerous, quick to modify and modular in nature, homes can be built much quicker and at an immediate reduction in costs as a result. Ultimately, giving a quick return on investment for the builder or owner. Lighter and sturdier than masonry, the required foundation needs to support less load and therefore further reduces the cost of construction. Working with an experienced and specialised company like WolfPack Rentals, budgets are controlled and unnecessary additional expenses are avoided. Conceptually, they always stand out – being built in a fraction of the time and appearing unique and tailored to their owners taste – a flurry of attention and word of mouth takes over, instantly sparking new interest in the units. 1. Does it get hot inside the containers? The Reefer model containers are used to transport refrigerated cargo. It has a very efficient thermal insulator and air-conditioners. The total cost of a container work is similar to the cost of a conventional small dwelling, with the advantages described above. 3. How durable are they? The container is designed for shipping in very adverse conditions and withstanding constant salt water and corrosion. Ashore, if properly maintained, it can last for generations! 4. In the case of lightning hit the container, are there any risk? A container works on the same principle of Faraday Cage: a conductor when loaded, tends to spread charges uniformly over its entire surface. If this conductor is a hollow sphere, for example, the effects of electric field created inside the conductor end up blanking, thereby obtaining an electric field null. It is the same principle as aircraft and cars, contrary to popular thought that the tires are doing this protection. 5. What if the container had been used to transport toxic or radioactive materials? Before the purchase a used container, the history of each container is researched. This history indicates the cargo type and the routes of each container. We additionally request a report issued by the port before the container is released. This report certifies that the container is free of any residue or radiation. 6. Is the material of the container flammable? The insulating layer of polyurethane is located between the inner and outer metal plates of the container, remaining totally isolated. 7. Will it be claustrophobic inside a container, such as 'in a sardine can'? Because it is a compact space, there is always a challenge of working well the ergonomics and comfort of the space. The furniture is designed to be efficient, coatings applied and vegetation cover combined with the cut-outs in the container walls to facilitate ventilation, lighting and movement. 8. How are the units transported and installed? Because containers are a standard size for transport, it can be transported by truck or shipped using the myriad of logistics companies shipping thousands of containers every day. Arriving at the final destination, a crane or munk truck is needed to remove it from the truck and put it on the ground. The foundation is quite simple due to the reduced weight of a container (compared to brick and mortar homes) and depending on the ground conditions, concrete blocks are enough to support it. Final cuts are then made, your plumbing and electrical services are installed (which can be internal or external) and finishes like flooring, painting and connections between modules are completed. It is a simplified and fast process. The container is made with highly resistant steel. Its original doors are designed to keep the module watertight when closed. To open it you need a blowtorch. When installing the containers, they are posted in the foundation, preventing them from being transported at any time. 10. What are the characteristics of a Reefer container? • Panels and door made of stainless steel, preventing corrosion. • The external panels can be made of aluminum or steel, depending on the model. • The thermal insulation is made of high density polyurethane with a thickness of 10cm. • The floor is a grid of aluminum, allowing a cushion of air beneath the floor installed.